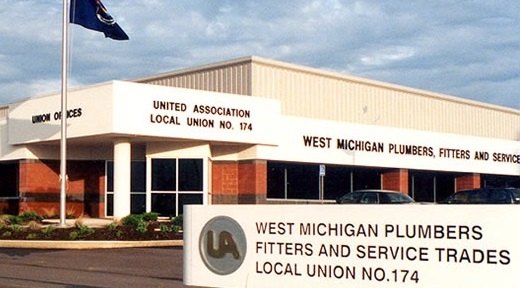 COOPERSVILLE February 23, 2015– The West Michigan Plumbers, Fitters and Service Trades Local 174 (UA 174) has announced an application and testing schedule for its apprenticeship program this spring. Here is a copy of their sample MATH and MECHANICAL test. Please bring a copy of your I.D. and high school diploma or GED. Local 174 offers a Department of Labor certified five year apprenticeship program. Each Local 174 apprentice receives in-depth on-the-job training coupled with a paid day in the classroom every other week. Once an apprentice graduates and becomes a journeyman, the training doesn’t stop. Continuing education and journeyman training allows their members to stay ahead of the ever-advancing technology in the industry. Local 174 journeymen commit to more than 10,000 hours annually in upgrade training. For more information on UA Local 174 and their apprenticeship programs, click here. For more labor education, apprenticeship and scholarship opportunities, click here. This entry was posted on February 23, 2015 by WMALC in Local news and tagged Coopersville, training, UA.